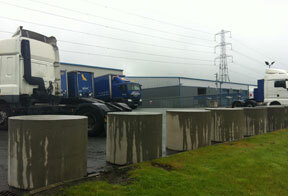 Cylindrical concrete barriers are a great solution for sites where a more robust barrier is required. Block CA & CB weigh 2.5 tonnes. Block CP is a planter block that weighs 1.4 tonnes. On a recent project, the barriers were used at the top of a steep grass slope which separated a lorry park from the car park below. The cylindrical concrete barriers were chosen because they would be heavy enough to stop a lorry in its tracks should one ever rollaway, before it reached the slope. 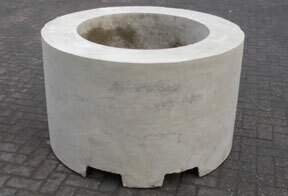 Cylindrical barriers have also been used as ballast for vehicle brake testing. Take a look at our before ordering and site preparation pages for advice on placing your order. All measurements are in mm.